As Courtney White explains in her article, “Little Normals” (see Solutions), we need to appreciate the various forms of normality we experience daily—pleasant memories, humor, contacts with friends, positive experiences, and so on. For example, Bettye and I were fortunate to spend a post-Labor Day week on the incredibly beautiful North Shore of Lake Superior, and each day we experienced natural wonders that appear to be normal, and apparently unchanging—the magnificent lake, the large rolling hills, the many rushing, rocky streams, and the occasional sightings of wildlife, especially soaring eagles. Yet, we realize that subtle, long-term environmental changes are slowly occurring, notably in the quality of flora and fauna habitat—everywhere. The effects of climate change spare no ecosystems, including the great north woods. (The News section features several articles on climate change.) Even the expansive wilderness’s formerly pristine water sources are endangered, including Lake Superior, which contains 10% of the earth’s available fresh surface water. What a shameful legacy to leave for future generations! A little more good news: On the last day of our trip, we were especially pleased to visit Victus Farm, an integrated production system of fish, plant, and algal products, with the potential of providing individuals and communities with healthy food and clean energy. This unique research-oriented aquaponic facility is co-sponsored by UMD’s Center for Sustainable Community and the city of Silver Bay, where it is located (see the website for more info). The photo at the top presents an exterior view, and the second photo (with Bettye) shows the gardening section of the interior hot house. 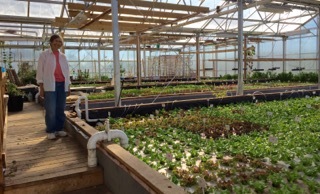 In using a combination of low-plus-high-tech equipment and materials, moderate-scaled aquaponic farming holds great promise in providing communities with locally grown, healthy food sources. Moreover, an individual can create a home aquaponic system somewhat easily and inexpensively. Several YouTube videos are available to explain and illustrate aquaponic systems (https://www.youtube.com/watch?v=n8XrnzTc-sg). John Michael Greer, an expert historian and futurist author, has not (so far) mentioned aquaponic farming in his series of fictional “Retrotopia” blog postings (see Views for 4 installments). But I suspect he would agree that such a practical farming method has a place in a low-tech, ecotechnic future scenario of American life. Largely due to declining energy and essential natural sources, Greer foresees a slow descent of civilization, at least in terms of material prosperity. Collapse may happen in certain places, but he contends that the general historical trend has been for great civilizations to slowly decline, as people seek practical ways to survive, and even prosper. “Retrotopia” provides a fictional perspective that’s based on a future business traveler’s experience, when traveling by train from Pittsburg to Toledo (Lakeland Republic), a few decades after America’s Second Civil War (this will get your attention). I think you’ll enjoy reading this creatively imagined fiction, which Greer has based on substantial evidence, including historical, current, and projected scenarios. > Resilience: Retrotopia: A Cab Ride In Toledo (John Michael Greer). This is the third installment of an exploration of some of the possible futures discussed on this blog, using the toolkit of narrative fiction. For the first installment, see: Retrotopia: Dawn Train from Pittsburgh and second: Retrotopia: The View from a Moving Window. > Ensia: A Long-Overdue Burial For The Population Vs Consumption Question (Stephanie Feldstein). Enough about whether population, consumption or production is the problem. We need to get to work on all of them – now. We first need to erase the false lines dividing population, consumption and production that should have been dismissed decades ago. With climate change snapping at our heels — drastically changing the shape of coastal communities, agriculture and ecosystems — we can’t afford to waste any more time on scapegoats. > Our Finite World: How Our Energy Problem Leads To A Debt Collapse Problem (Gail Tverberg). When examining long-term relationships in the economy, the conclusion is that we are building debt to unsustainably high levels, thanks to today’s high cost of producing energy products. To turn this around would require immediate production of huge quantities of incredibly cheap energy products–with oil at less than $20 per barrel in 2014$, and other energy products with comparably low cost structures. Our goal would need to be to get back to the energy cost levels that we had prior to the run-up in costs in the 1970s. In this post, 10 insights explain the reasoning that supports this conclusion. > CASSE-The Daly News: Where Is Pope Francis On Economic Growth? (David Kane). Those who believe that there is a fundamental conflict between economic growth and environmental protection will find Pope Francis’ recent encyclical, Laudato Si (Praised Be), a welcome addition to the literature; as well as an important tool in helping others, especially Catholics, to understand and accept the limitations of economic growth. Pope Francis explains how the environmental and social crises we are experiencing will require “profound changes in lifestyles, models of production and consumption, and the established structures of power which today govern societies.” Few in the world have as large a reach as the pope, so it is encouraging to hear him speaking so clearly on these crucial issues. > CASSE-The Daly News: What Kind Of Future Does Your Degree Prepare You For? (James Magnus-Johnston). It is clear that what is acceptable to one discipline (such as environmental science) may be unacceptable to another (such as economics). Yet by understanding what sort of future we’re in for, and by knowing the stakes of the present moment, we cannot claim neutrality or indifference to the consequences of our arguments. Rather, we should work harder to understand the big picture of economy-environment dynamics, and overcome inherent disciplinary biases. Every discipline, and every student, should be (re) considering what kind of future they think they’re preparing for. A creative, unconventional framework is exactly what we need. > Climate Progress: We’re Aiming At 200 Feet Or More Of Sea Level (Joe Romm). Homo sapiens sapiens, the species with the ironic name, is not known for long-term thinking. So if the very real danger of Sandy-level storm surges coming every year or two in a half century — along with Dust-Bowlification of a third of the Earth’s habitable and arable landmass — isn’t enough to stop us from using the atmosphere as an open sewer for carbon pollution, then the prospect we are going to melt all of the Earth’s land ice and raise sea levels more than 200 feet over the next few millennia or so ain’t gonna do the trick. > Climate Progress: This Is Your Brain On Climate Change (Jeremy Deaton). Washington, D.C. psychiatrist and climate activist Lise Van Susteren offers guidance for coping with climate-induced anxiety [pre-traumatic stress]. Take care of yourself, she says. Sleep. Exercise. Nurture relationships with friends and family. Laugh, dance, and play games. But most of all, she says, do something. Climate action can make for powerful medicine. It can restore self-efficacy and banish fear and fatalism. Granted, said Van Susteren, “you still need to have a strong stomach and a certain resiliency to want to go down into the trenches.” But that way lies hope, community and a shared sense of purpose”. > Newsweek: Climate Change Will Cause The World’s Next Migration Crisis (Frank Bierman). The Value of Land, published Sept. 15th by The Economics of Land Degradation Initiative, offers a shocking depiction of the state of our global environment. According to this new study, the percentage of land affected by serious drought has doubled from the 1970s to the early 2000s. One third of the world appears vulnerable to further land degradation. About half of our planet’s agricultural land is moderately or severely degraded. There is no doubt that this situation will have major impacts on the livelihood of millions of people, especially the poorest of the poor. It might also reinforce current migration patterns. > Inside Climate News: Migrant Crisis: ‘If We Don’t Stop Climate Change . . . What We See Now Is Just The Beginning (Phil McKenna). Today’s migrant crisis may be due in part to climate change, says Frank Biermann, a professor of political science and environmental policy sciences at VU University Amsterdam. In Syria, where 7.6 million people are displaced inside the country and another 4 million are seeking asylum elsewhere, a severe drought plagued the country from 2006-09. A recent study pinned the blame for that drought on climate change, and the drought has been cited as a contributing factor to the unrest there. Millions of additional refugees may need to leave their homes in coming decades as a result of a changing climate, Biermann said. > Union of Concerned Scientists: Is Global Warming Fueling Increased Wildfire Risks? The effects of global warming on temperature, precipitation levels, and soil moisture are turning many of our forests into kindling during wildfire season. As the climate warms, moisture and precipitation levels are changing, with wet areas becoming wetter and dry areas becoming drier. > Yale Environment 360: Will The Paris Climate Talks Be Too Little And Too Late? (Fred Pearce). At the upcoming U.N. climate conference, most of the world’s major nations will pledge to make significant reductions in greenhouse gas emissions. But serious doubts remain as to whether these promised cuts will be nearly enough to avoid the most severe impacts of climate change. > AP: Big Cities Scramble To Be Prepared For An Oil-Train Disaster. While railroads have long carried hazardous materials through congested urban areas, cities are now scrambling to formulate emergency plans and to train firefighters amid the latest safety threat: a fiftyfold increase in crude shipments that critics say has put millions of people living or working near the tracks at heightened risk of derailment, fire and explosion. > Economic Policy Institute: Incomes And Wages Are Still Flat (Lawrence Mishel & Alyssa Davis). We learned from the Census Bureau Friday morning that the decent employment growth in 2014 yielded no improvements in wages and, not surprisingly, no improvement in the median incomes of working-age households or drop in the number of people living in poverty. Wage trends greatly determine how fast incomes at the middle and bottom grow, as well as the overall path of income inequality, as we argued in Raising America’s Pay. This is for the simple reason that most households, including those with low incomes, rely on labor earnings for the vast majority of their income. > Think Progress: The Richest Americans Got Richer Last Year While The Rest Of Us Muddled Along (Bruce Covert). While income for the richest Americans has rebounded since the recession, that isn’t true for those in the middle or the bottom. The richest 10 percent of Americans saw their income increase from $150,000 in 2013 to $157,500 in 2014, while the richest 5 percent went from $196,000 to $206,600. Meanwhile, the poorest 10 percent of Americans saw a slight decline from $12,400 to $12,300 and have seen virtually no improvement for decades. The richest Americans take home more of the country’s income than they did in the roaring 1920s. > Resilience: Little Normals (Courtney White). There are many examples of little normals that remain largely unfazed by the changing nature of the “big normals”. Global warming is a big normal with big consequences, but it doesn’t alter our need to be loved, to care for other creatures, or to be remembered. Resilience means seeking out the ”little normals” – the constants in human nature, including the behaviors, institutions, and durable scales, that have stood the test of time – and reengaging with them meaningfully. > Common Dreams: Surgeon General’s Prescription For Health: Walk More (Jay Walljasper). In the Call to Action on Walking US Surgeon General Vivek H. Murthy explains that “An average of 22 minutes a day of physical activity – such as brisk walking – can significantly reduce the risk of heart disease and diabetes. The key is to get started because even a small first effort can make a big difference in improving the personal health of an individual and the public health of the nation.” Murthy announced a national campaign to encourage Americans to walk more and make all communities safer and easier for walking. His office will partner with schools, citizens groups and businesses to meet these goals. > Resilience: The Simpler Way: Economics Of Happiness (Samuel Alexander, Helena Norberg-Hodge). This full-length interview with Helena Norberg-Hodge is well worth everyone’s attention. > Ecological Gardening: Why Not Start Today? Backyard Carbon Sequestration Is Something Nearly Everybody Can Do (Adrian Ayers Fisher). Yet we can do something. For the first part, we can consciously reduce our lifestyles and become actively civically engaged; for the second, we can practice backyard carbon sequestration by becoming carbon gardeners, ourselves, and in the company of others. Soil carbon sequestration is something you can do, on your own, fairly easily. You will have to give some things up, such as synthetic fertilizer, but rather than feeling deprived, you will be helping create abundance. > Clean Energy Resource Team (CERT): Metro CERT Annual Event 2015. Thurs., Oct. 22, 3-7 p.m., Science Museum of MN, St. Paul. Info: Diana McKeown, Metro CERT Director (dmckeown@gpisd.net) or (612-278-7158). > MN Pollution Control Agency: Free Eco-Experience Downloadable Handouts–Climate change: air quality; reducing, reusing, & recycling; water; and Nature Adventure Play.